2014 Pensacola Blue Wahoos - Fresh Fitted Friday!!! This cap features a fun logo from the guys at Brandiose. I always dig their work. This scombrid is a mighty surly one indeed. Notice how the Wahoo is gripping a bat with some mysterious phantom phalanges. I just trademarked "Phantom Phalanges" as a band name, btw. Nothing crazy about these sweatband tags but maybe one day they will seem crazy! That is an MILB batterman logo in Pink, White and Blue. I love it. If you have been keeping up with the blog over the past few weeks, you might have noticed the focus on caps from teams that play in Major League Baseball's spring training states. I've said this many times before, but the most hopeful time of the year for a baseball fan is when spring training reaches its final weeks as it is now. Being a fan of the San Francisco Giants, it pains me to see my team floundering in the spring instead of deftly defending the championship that they won last November. As of publishing time, the Giants' win-loss record of 6-18 gives them a winning percentage of .250 which is the lowest of all MLB teams. Meanwhile their biggest rival, the Los Angeles Dodgers, have a win-loss line of 13-6. Their .684 winning percentage is the highest in all of MLB. However, let's not forget that their schadenfreude is fleeting, as the regular season begins in just over a week. To feel better in times like these I have to remind myself of all the awful things that have happened to the Dodgers. One of my favorite "Dodger Fails" is when they traded future Hall Of Famer Pedro Martinez to the Montreal Expos for Delino Deshields. That was a straight up trade by the way. Besides the fact that this transaction left a long-lasting bitter taste in the rotting mouths of my archenemies, I mostly feel empathy in regards to DeShields' struggles that resulted from the trade. In the strike-shortened 1994 season, the mediocre Dodgers finished at the top of the National League West division at 58-56 while the Expos posted a magnificent 74-40 record. I'm sure DeShields would have loved to have been part of that historic team, but no one knows what it would have looked like without Pedro's 11-5 season. DeShields probably didn't concern himself with what-if's as he was preoccupied with his inability to remain healthy during his first year in Los Angeles. He bounced back somewhat the following year and his last season as a Dodger was his most forgettable one in the big leagues. I suppose one positive note is that he did manage to get himself 8 triples and steal 49 bases in 1996. Even though DeShields never achieved his projected potential as a player, he is rising up the ranks as a manager in the Cincinnati Reds' minor league system. 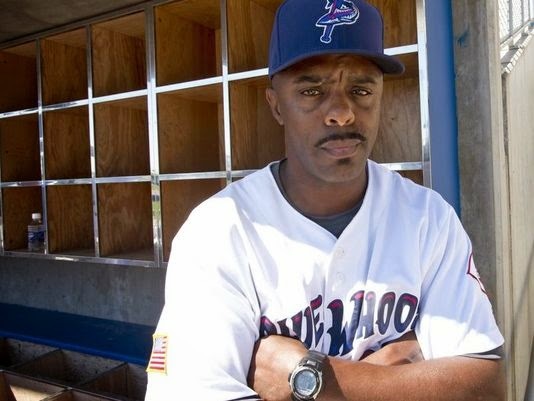 Despite the fact that three of the five teams that he has coached have had losing records, he is making the jump from the Double-A Pensacola Blue Wahoos to the Triple-A Louisville Bats in 2015. I am looking forward to DeShields' future managerial successes but I'll finish with this fun photo of him wearing a Blue Wahoos cap while enjoying that warm Florida sunshine! This man is thrilled to be wearing a variation of this week's Fresh Fitted. One last note: when it comes to baseball statistics, the only things I love more than home-runs are triples and stolen bases. Delino DeShields was a master at stealing amassed a healthy number of triples (at least in the modern-era of baseball) also. One guy who I predict will get lots of three-baggers and swipe lots of bases in his budding career is DeShield's eldest son, Delino DeShields Jr. I hope that there is more to come regarding this phenom in the future!